For a while now, there has seemed to be an increase in the use of the prefix geo. I remember being a bit annoyed about it – I’d be reading some random news article and the author would talk about “geoblocking” or “geofencing” or – help us – “geolocation”. I realised my annoyance stemmed from the fact that the terms were often used in the wrong context, or that the author seemed to misunderstand their definitions. That’s different now. Over the past few weeks, I’ve been learning how to use ESRI’s GeoEvent Extension for ArcGIS for Server (could that name be any longer?). I’m learning how to set up a geofence to geoblock end users based on their geolocation (ha!). While I will elaborate more on my adventures with GeoEvent in another post, a couple of other things have happened over the past two months which have led me to rethink my stance on what I do. 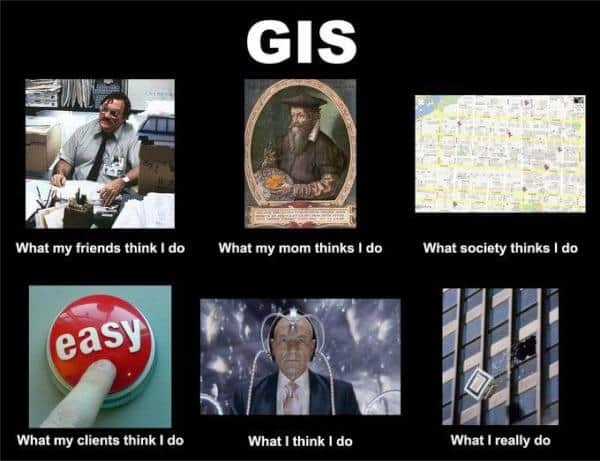 The nature of my work as a GIS Technician on the Enterprise GIS team requires me to be good at a number of different things, including things which aren’t strictly GIS. That’s fine – I love doing it, and I enjoy determining what the best combination of technologies would be to solve a particular problem. However, there is one particular aspect of my work which is a continuous challenge, which constantly forces me to adapt, learn, research, and improve my skills in it everyday, because there is always something new. Programming. Specifically, programming for GIS, although lately I have been stepping outside of that arena as part of a side project. It’s where I’m focussing my efforts whenever I have “free” time. All the GIS work I do, my studies at UNISA in preparation for Honours, my MOOCs – it’s all for one thing: to be a geodeveloper. Geodeveloper (n): A developer who specialises in, and focuses on, programming specifically for use within the GIS/Geoinformatics field.